Many women choose to travel abroad to give birth. Some of these women decide that travelling is in their best interest as they prefer to be closer to family for the birth. Other women may decide that they don’t mind travelling in order to give birth with a particular doctor or at a particular facility. Still others choose to travel abroad to give birth due to personal preference or for private reasons. The Department of Health may foot the bill for some women to travel abroad to give birth, but regardless of who pays for it giving birth abroad requires careful planning. Women who do decide to travel abroad to give birth should take care to bring their medical history with them, to choose an itinerary appropriate for a pregnant woman, to select a facility that can accommodate emergencies, and to find out how to register the birth of their child while abroad. Women who want to give birth abroad should contact the Department of Health as early as possible. Under European Commission regulations, women do have the option of giving birth in any European Economic Area member state. However, women will need to make their case about why they want to go abroad to give birth and why they require such care outside of the UK. Women will also need to present evidence of their due dates from their doctors or midwives. Also at this time women should include their addresses, National Insurance numbers, dates of birth and planned dates of travel for the birth. A GP or consultant will be able to offer more information about the Department of Health and giving birth abroad. Women who do decide to travel abroad to give birth should bring as much documentation as possible regarding their own medical history and the antenatal care that they have received during their pregnancies. This documentation should include details of all tests and scans carried out during the pregnancy as well as any medications prescribed for the mother or any instances in which bed rest was advised. Women who plan to travel abroad to give birth should advise their doctors and midwives of this as early as possible so that all required information can be collected before it is time to travel. It is not recommended that pregnant women fly more than three hours when they travel to give birth abroad. It is also not recommended that such women then travel for more than three hours when they land (such as by car, bus or train). With these guidelines in mind, women should strive to find a travel schedule that will not over-tax their bodies, make them travel too close to the due date or restrict the items (for themselves or their babies) that they can bring with them as luggage. Selecting an appropriate facility in which to give birth abroad is important for women who are travelling. If possible women should be in contact with a doctor or clinic prior to leaving home so that it is known that they will be giving birth and can be put on the “schedule”. 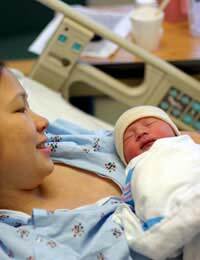 Women should look for facilities large enough to accommodate any emergencies that could arise, or for facilities known to deal well with any other factors (the birth of multiples, water births, etc.). Family and friends who live in the area where a woman will give birth can be a great resource when it comes time to pick a facility and a doctor. Women who give birth abroad will receive a birth certificate from that country but will need to register their child’s birth with the British authorities. There are some exclusions to this rule, however, as there are some countries in which foreign births can not be registered. Women who plan to travel abroad to give birth should check with the British authorities in that country to find out more about registering a birth abroad. Travelling abroad to give birth requires a fair amount of planning. Women interested in travelling abroad to give birth should make this decision as early as possible to give themselves the greatest amount of time to organise their travel and medical plans. I have had three Caesarean sections, I just find out I am expecting another baby, I am a bit apprehensive due to the kind of medicare available in my country. Please how do I go about it? will they give me visa for this reason? finally is there any organization that can help me out because I am afraid I might not be able to meet all the financial demand it might involve.